Yahoo’s first Mobile Developer Conference took place in San Francisco last week. Over 1,000 attendees—including Appency—gathered to learn about Yahoo’s new and improved mobile offerings, and the results lived up to the hype. 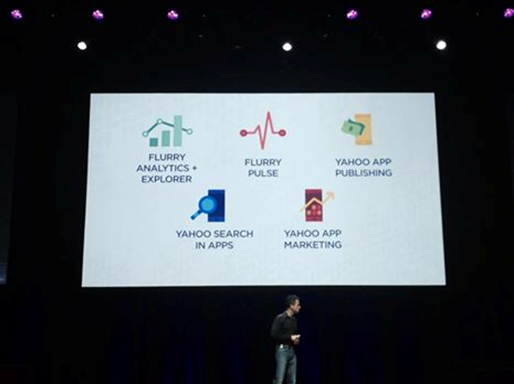 Yahoo launched of a new suite of products to help developers analyze, advertise, and monetize their apps. These products combine Yahoo’s years of advertising technology with the mobile expertise of Flurry and BrightRoll, which joined Yahoo in 2014. Flurry’s been around since the launch of the iTunes App Store. They provide developers the data they need to understand their audience, benchmarked with data from over 630 billion apps. Partnering with Yahoo gives them access to an enormous audience across multiple device platforms and technologies. Appency has used Flurry analytics for years, and we find these new updates very exciting, providing plenty of opportunity for our clients. BrightRoll provides solutions for the entire video ecosystem. Their partnership will help create a complete suite of solutions. Flurry has updated their analytics and now allows users to ask even more complex questions about their data than before, and the platform shows insights immediately. Developers can create custom events relevant to their specific app and reference them against any other piece of data Flurry gathers, and see immediate results. For instance, Instagram could track engagement by monitoring when users upload a photo, then cross reference that even against time of day to see when users are most engaged. As we have come to expect from Flurry, these new features have an easy-to-use interface and provide in-depth graphs. Importantly, these new analytics tools are free and require no new codes or new SDKs. Flurry Pulse makes it easy for developers to share app signals with partners using their existing Flurry SDKs. Pulse shrinks the app’s size and saves developers time: With fewer SDK implementations, developers can get an app out the door faster and still work with a broad range of partners. A partnership with comScore helps make this possible. Yahoo announced that developers now have the ability to monetize their apps with video ads, display ads, and native ads using Yahoo Gemini, BrightRoll, and Flurry. These are the same tools that Yahoo used to revamp their apps and they have seen a huge increase in their click-through rate and engagement, so it will be interesting to see how these tools translate from web to mobile. This feature allows developers to integrate Yahoo Search into their apps. It improves experience by allowing users to search in the app instead of leaving the app to search. During the past few months Yahoo’s has seen an increase in retention and engagement with Search in apps, so we may see Yahoo coming back as a mobile search competitor, especially after users shared concerns about privacy and Google Chrome. Developers can now buy targeted native and video advertising across Yahoo’s network of 75 million monthly users with Yahoo Gemini’s native and mobile search marketplace, which could be a good opportunity to easily reach a broad audience. To learn more check out www.developer.yahoo.com, or contact us here at Appency to get help with your own mobile advertising campaign.